Olympic golds medal-winning coach Sergio Batista was poised on Monday to succeed Diego Maradona and lead Argentina to the 2014 World Cup in Brazil. Batista has been interim coach since Maradona was refused a new contract after Argentina's humiliating 4-0 defeat by Germany in this year's World Cup quarter-finals in South Africa. Maradona, upset at being discarded, had a dig at his former team-mate in Argentina's 1986 World Cup-winning side as he left the country on a trip to China on Monday night. 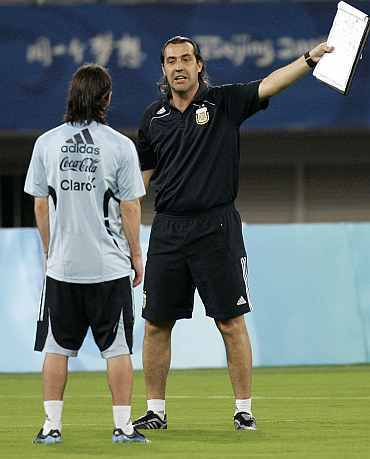 "I was very proud to have trained (Lionel) Messi. With me he was happy, don't you doubt it...I understood him like no-one else," Maradona told reporters. "If 'Checho' (Batista) says now that Messi's happy, it's because he dressed up as a clown. 'Checho' can't make anyone happy," he added. Batista has said that Messi, in his tactical formations, is as comfortable as when he is playing for Barcelona and the gifted forward has supported the coach in this. Messi was often questioned by Argentines during the World Cup qualifiers in 2008 and 2009 to why he did not generally reproduce his scintillating Barcelona form in Argentina's colours. Maradona said his 50th birthday on Saturday was the saddest day of his life because he no longer had the Argentina team. Batista, 47, was grilled on Monday by an Argentine Football Association (AFA) selection committee and is expected to be officially installed on Tuesday. "The selection committee met at midday with technical secretary Carlos Bilardo at the AFA and Sergio Batista was called in to report on what has been done so far and his plans for the future," AFA spokesman Andres Ventura said. He told reporters outside the AFA's downtown headquarters that the committee would report to AFA president Julio Grondona and the board would make its decision. Batista appears to be the sole candidate whereas local media have speculated for weeks with other names, including Estudiantes coach Alejandro Sabella. Batista, who steered an Argentina side including Lionel Messi and Javier Mascherano to the country's second successive Olympic gold medal in Beijing in 2008, has a low profile that contrasts with Maradona. 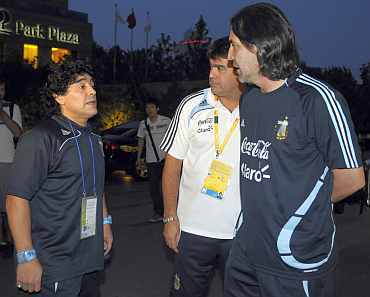 Maradona was at the centre of several controversies during his 20 months in charge and refused to accept the AFA's wish to include Batista on his coaching staff. 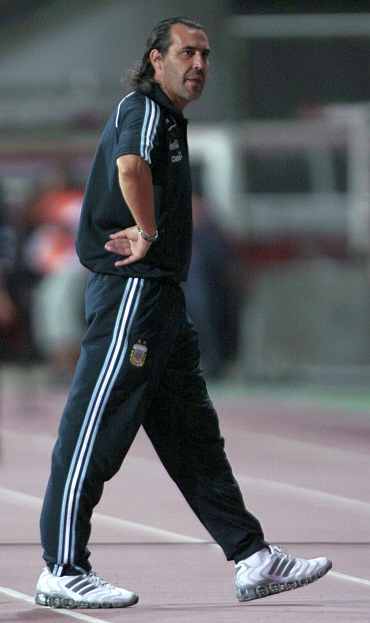 He lost the job over his loyalty to his World Cup assistants Alejandro Mancuso and Hector Enrique after Grondona made it a condition of his continuity that the pair should go. Batista's first task if he is appointed will be to name a squad to play arch-rivals Brazil in a friendly in Qatar on November 17. So far, he has presided over a 1-0 win over Ireland in Dublin, a 4-1 victory against world champions Spain in Buenos Aires and a 1-0 defeat in Japan, all in friendlies.